Kickoff Show match results via wwe.com: The very personal rivalry between Big Cass & Enzo and Rusev & Lana took yet another brutal turn at Roadblock: End of the Line where Cass and Rusev collided in an intense, yet inconclusive battle. Looking to batter Cass like he battered Enzo in a hotel room sneak attack several weeks ago, an angry Rusev attempted to use his brute strength to keep Cass down. It wouldn’t be so easy to stop the seven-footer, though, as the big New Yorker channeled his rage and took control for a majority of the contest. It looked like Cass was going to ride that momentum to victory until the match spilled to the outside. After a bit of jockeying back and forth on the floor and even in the crowd, Rusev smashed a distracted Enzo to the ground in ugly fashion. Big Cass went to check on his fallen buddy, which allowed The Bulgarian Brute to slide back into the ring to beat the referee’s 10 count for a contentious victory. 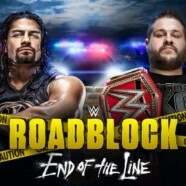 Rusev and his bride may have left Roadblock: End of the Line feeling like victors, but this rivalry is far from over. We start with Kofi Kingston and Cesaro. Cesaro with an immediate dropkick and then a series of uppercuts. Kofi catches Cesaro with a boot in the corner. Cesaro catches Kofi during a cross body attempt. Kofi with a monkey flip on Cesaro who lands on his feet. Kofi lands on his feet during a monkey flip by Cesaro. Kofi avoids a Cesaro Swing and Sheamus with a clothesline to Kofi with the referee distracted. Sheamus gets the tag and stomps away. Cesaro gets the tag and stomps over Kofi. Quick tag back to Sheamus who launches himself in over the top rope catching Kofi with a shoulder block. Kofi with a jawbreaker and Sheamus takes out Big E to prevent a tag. Sheamus and Cesaro with a series of shots to Kofi and Cesaro gets the tag tossing up Kofi up and catching him with an uppercut on the way down. Cesaro gets a two count. Sheamus gets the tag and is tossed out by Kofi. Kofi avoids forearms to the chest and tags in Big E. Big E with his spear on Sheamus through the second rope! Big E tosses Sheamus back in, hits the ropes and splashes over Sheamus for a two count. Sheamus drops Big E back first over the ropes, misses a Brogue Kick and Big E counters into a powerbomb for a two count. Sheamus with a version of White Noise with help from Cesaro as Cesaro gets the tag on Big E. Cesaro with a spinning corkscrew uppercut off the ropes catching Big E! Cesaro is setting up Big E for the Cesaro Swing. Sheamus accidentally takes out Cesaro due to Kofi. Woods with a kick to the face of Cesaro from the ring apron. Big Ending on Cesaro. Cesaro kicks out! Big E can’t believe it. Cesaro dumps Big E out. Cesaro with a top rope huricanrana on Kofi. Brogue Kick on Big E on the outside. Cesaro with the Cesaro Swing on Kofi. Cesaro with a Sharpshooter on Kofi. Woods distracts the referee as Kofi was tapping out. Cesaro breaks the hold and gets in the face of the referee. Kofi attempts a small package. Cesaro counters, lifts Kofi up in a vertical suplex and then drops him down with a Neutralizer. Big E breaks up the pinfall. Cesaro takes out Big E leaping over the top rope. We are left with Sheamus and Kofi in the ring. Woods pushes Kofi out of the way and eats a Brogue Kick. Kofi with an S.O.S. on Sheamus and Sheamus kicks out. Kofi with the Trouble in Paradise on Cesaro. Cesaro is not the legal man. Sheamus dives in and rolls up Kofi to get the pinfall. We have new tag champions. After the match, we see The New Day clutching the tag team titles in the corner. They get up and hand them over to Cesaro. Cesaro embraces New Day. Sheamus sees this, pulls away both tag team titles and celebrates up on the corner. During a replay, we see that Sheamus and Cesaro faked out Kofi Kingston with Sheamus pretending to tag in Cesaro. This helped setup the finish. Video airs showing the events leading up to Mick Foley granting Sami Zayn a match with Braun Strowman including Foley teasing a trade for Zayn to Smackdown Live. The referee calls for the bell and the countdown begins at 10:00 minutes. Commentary reminds us that Sami just has to survive the length of time to win. Zayn with a quick chop to Strowman in the corner. Zayn with a huricanrana sending Strowman to the ropes and then catches him with a dropkick. Zayn with right hands to Strowman in the corner. Strowman grabs Zayn and tosses him across the ring. Strowman with a big splash in the corner on Zayn. Zayn rolls out of the ring and Strowman with a shot to the chest of Zayn. Back inside, Strowman kicks Zayn in the gut and chokes him against the second rope. Strowman with more shots to the chest of Zayn. Strowman chokes Zayn again on the second rope using his knee. Strowman charges and Zayn pulls down the top rope sending him over. Zayn launches himself over the top rope. Strowman catches Zayn and drops him face first off the ring apron. Strowman tosses Zayn back in at the 6:50 mark. Strowman with another splash in the corner and follows it up with a big clothesline on Zayn. Strowman avoids pinning Zayn right away as Zayn fires off a chop to his chest. Strowman levels Zayn with a big clothesline. Strowman starts smiling as Zayn recovers in the corner. Strowman with a forearm to the jaw of Zayn as he gets back up. Strowman with a huge forearm to the chest of Zayn as he yells at Zayn to stay down. Strowman with a scoop slam on Zayn. Strowman follows that up with another big clothesline on Zayn. We then see Mick Foley walking down the ramp with a white towel in his hand. Strowman tosses Zayn out of the ring in front of Foley. Strowman yells at Foley to throw the towel or he will keep going. Foley tells Zayn no one will doubt his courage. Zayn is pleading with Foley to not throw the towel in. Zayn grabs the towel and throws it away. “Not like that,” says Zayn. Strowman with a huge blow to the back of Zayn’s head. Strowman charges and Zayn moves out of the way. Strowman hits the post head on. We have 1:30 left in the match. Strowman again charges and he plows through the timekeepers barricade area when Zayn moves out of the way again. We have 45 seconds left as Strowman gets back in the ring with Zayn. Strowman hits the corner shoulder first when Zayn moves. Zayn is up top, jumps and catches Strowman with a cross body. Strowman power kicks out and tosses Zayn out of the ring. 10 seconds remain as Zayn connects with his Helluva Kick in the corner. The time expires. Zayn survives. After the match, Sami Zayn recovers in the corner as we see a very upset Braun Strowman. Strowman kicks the ropes. We see a few highlights from the match. Lock up and Rollins quickly throws Jericho aside. Jericho with a side headlock to ground Rollins. Jericho catches Rollins early with a shoulder block. Jericho works over the left arm of Rollins. Rollins counters with an arm drag and works over the left arm of Jericho. Rollins with a big kick to the chest of Jericho. Jericho catches Rollins with a boot in the corner. Jericho follows that up with a dropkick from the second rope for a two count. Rollins with a back suplex and throws rights. Jericho with shots to Rollins in the corner including a chop. Rollins with a clothesline and Jericho pulls himself out of the ring. Rollins with a flying knee catching Jericho on the outside. Rollins tosses Jericho into the barricade. Back inside, Jericho with a rake to the eyes with the referee trying to push Rollins away. Jericho with a shot on Rollins. Chops by Jericho. Rollins sends Jericho to the corner. Jericho tosses Rollins over. Rollins with rights from the ring apron. Referee breaks it up. Jericho with a springboard dropkick catching Rollins on the ring apron. The referee starts the count. Referee gets to 9 and Rollins slides back in. Jericho tackles and throws right. Jericho catches Rollins with a big dropkick. Jericho with slaps to Rollins. Rollins returns with slaps of his own along with a kick to the gut. Jericho catches Rollins with a knee. Rollins with a kick to the back of Jericho’s head. Jericho goes for a bulldog and Rollins crotches him in the corner. Rollins with blocks and rights. Rollins with his jumping Sling Blade takedown. Rollins with a jumping forearm, a second forearm, Jericho falls forward, Rollins is up on the second rope and connects with a Blockbuster for a two count. Jericho counters a Pedigree. Rollins counters a Walls of Jericho. Jericho with a kick to the head of Rollins. Rollins counters a Lionsault by pushing Jericho over the top rope. Rollins with a suicide dive to Jericho and tosses him back in. Rollins springboards up, Jericho catches him by his leg and turns him over into the Walls of Jericho. Rollins is able to break free. Rollins goes for a frog splash and Jericho moves. Jericho with a Lionsault for a two count. Series of crazy counters leading to Jericho getting the Walls of Jericho locked in again. Rollins counters into a small package for a two count. Jericho is up top, Rollins catches him with a kick and then a kick to the jaw. Rollins with a frog splash off the top. Kevin Owens runs down and Rollins with right hands to Owens kicking him away. Jericho with a small package and Rollins kicks out. Jericho counters a Pedigree and yells at Owens asking what he is doing. Rollins counters a Codebreaker attempt into a Pedigree for the pinfall. Austin Aries (replacing Byron Saxton) joins Michael Cole and Corey Graves on commentary for tonight’s Cruiserweight Championship match. The bell rings and TJ Perkins goes right after Brian Kendrick. Rich Swann with rights to Kendrick. Swann tries to jump over Kendrick and he ends up hitting him right in the face with his knee. That didn’t go well. Kendrick rolls out leaving Swann with Perkins. Kendrick pulls Swann out and lands a right. Perkins with a dropkick to Kendrick through the ropes and tosses him back in. Perkins with a knee bar on Kendrick after coming off the top rope. Kendrick breaks free and kicks Perkins in the face. Swann with a kick to the back of Kendrick’s head. Swann with a double huricanrana on Kendrick and Perkins. Swann uses Perkins to launch himself into Kendrick. Swann eats a big kick from Kendrick and Kendrick with a heel kick to Perkins resulting in a two count. Swann with a top rope dropkick catching Perkins. Kendrick has Swann down in the Captain’s Hook. Swann is reaching for the ropes. Perkins is back in and Kendrick kicks him away. Perkins gets a knee bar applied on Kendrick. Kendrick is reaching for the ropes. Swann with a splash over Perkins to break it up. Perkins catches Kendrick with a superkick. Perkins has the knee bar on Swann. Swann is able to get to the ropes to break it up. Cole reminds us it is No DQ rules in a triple threat and is wondering why he broke the submission. Swann and Perkins exchange elbows. Swann and Perkins with a double superkick on Kendrick. Swann with a superkick on Perkins. Swann hooks the leg of Perkins and gets the pinfall to retain his title. After the match, Neville’s pyro goes off and his music hits. Neville gets inside the ring and teases he is going to embrace Swann when he blasts him with a right hand. Neville with stomps to Swann. TJ Perkins walks up and he takes shots from Neville. Neville with a sliding dropkick to the face of Perkins. Michael Cole reminds us that Neville trained Swann. Neville tosses Swann over the top rope and launches him into the barricade. We get introductions for the challenger Charlotte and champion Sasha Banks. The bell rings and the clock begins to rundown from the 30:00 mark. Lock up and Banks tosses Charlotte aside still staying locked up. Both roll around and remain locked up. Charlotte pushes Banks away. Banks works over the left arm of Charlotte. Charlotte with a headlock takedown on Banks. Banks with a headlock takedown of her own. Banks with knee strikes. Charlotte fires back with a shoulder tackle. Banks with kicks to Charlotte and catches her with a big elbow. Banks goes for a takedown, Charlotte rolls through and Banks goes for a Bank Statement. Charlotte counters and rolls out. Banks with pinfall attempts and then keeps Charlotte grounded in a front face lock. Banks drops Charlotte with a quick dropkick. Banks does the Flair strut in Charlotte’s direction. Charlotte kicks Banks in the face and then kicks her in the chest. Banks takes the back of Charlotte and goes for a sleeper hold. Charlotte breaks it up with a sitting jawbreaker that results in a two count off a pinfall attempt. Charlotte sends Banks face first into the corner repeatedly. Banks with double knees off the ring apron catching Charlotte. Banks with a backbreaker on Charlotte while pulling both of her arms across her neck. Charlotte breaks free and Banks kicks her right in the face. Charlotte with a high elbow and is tossed out by Banks. Banks with a suicide dive taking out Charlotte. Charlotte then sends Banks face first into the steel steps when she trips her up on the ring apron. Back inside, Charlotte mounts Banks and throws some right hands with 18:00 minutes left to go. Charlotte with a snapmare and knees to Banks. Banks avoids another knee from Charlotte. Charlotte with a backbreaker and neckbreaker combo on Banks. Charlotte drops another knee. Banks attempts a Bank Statement. Charlotte powers out tossing her to the corner. Charlotte drops Banks right on her head in the corner and gets another close two count. Banks with kicks and elbows to Charlotte from the corner. Banks with big chops and right hands to Charlotte. Banks with double knees in the corner, tosses Charlotte to the middle, goes up top and misses a cross body when Charlotte moves. Charlotte with a Natural Selection and Banks kicks out. Both are in the corner. Charlotte with a Natural Selection off the top on Banks and gets a pinfall. Charlotte is slapping Banks and getting confident. Banks fires back with slaps of her own. Charlotte with a big lifting back suplex and Banks kicks out. Banks is dropping elbows to the back of Charlotte’s neck. Series of counters by Banks and rolls up Charlotte for a pinfall. Charlotte quickly catches Banks with a boot to the face and a two count off the pinfall attempt. Charlotte gets Banks setup in the corner. Charlotte goes for a moonsault and Banks moves out of the way. Banks with the Bank Statement locked on. Charlotte gets close to the bottom rope. Banks turns her over and applies the Bank Statement again. Charlotte taps. Charlotte and Banks exchange shots. Charlotte trips up Banks in the corner and takes out the knee of Banks. Charlotte is trying to grab Banks and Banks is fighting her off. Charlotte throws another shot to the knee of Banks and then drops her body weight over it. Banks with a right hand to counter a Figure Four setup. Charlotte pulls Banks to the corner and throws her knee against it. Charlotte glances at the clock and rolls back in. Charlotte works over the knee of Banks and then pulls back on it. 2:40 mark and Charlotte is still working over the knee of Banks. 2:00 to go and Charlotte gets the Figure Four applied. Banks is trying to fight out of it. Charlotte is dragging Banks to the center of the ring. Banks is trying to turn over. Banks gets Charlotte turned over. Charlotte turns Banks back over. Banks and Charlotte are exchanging shots with 1:00 to go on the clock. 40 seconds to go and Charlotte is yelling at Banks to tap out. Banks is grabbing the arm of Charlotte. 20 seconds to go. Charlotte drags Banks to the center of the ring. Figure Eight is locked in. Banks taps with 3 seconds to go. We are tied as time expires. The referee rules the match will continue under sudden death rules. Charlotte with a shot to the bad knee of Banks in the corner. Charlotte is smiling. Banks orders for the match to be started. The bell rings and Banks with a close roll up for a two count. Charlotte with a fallaway slam on Banks. Banks with another roll up for a two count. Banks gets the Bank Statement applied. Charlotte is going for the leg of Banks. Banks is busted open over her nose and mouth. Charlotte counters and gets the Figure Four locked in. Banks is screaming out in pain. Charlotte is trying to bridge up to a Figure Eight as Banks is reaching out for the bottom rope. Charlotte drags Banks back out. Figure Eight is locked in. Banks taps out. Charlotte is the new champion. The bell rings and Kevin Owens bails to take a walk around the ring. Owens gets back inside and does this a second time. Reigns walks out and goes after him connecting with a right hand and tossing Owens back inside. Reigns with more rights. Owens bails again. Reigns bounces the face of Owens off the announce table. Back inside, Owens cuts off Reigns and gets in shots of his own including a chop. Owens with a headlock takedown. Reigns powers out planting Owens over the mat. On the outside, Reigns sends Owens into the barricade. Reigns is clearing off an announce table at ringside when Owens walks up hitting rights. Owens tosses Reigns back in and connects with a running senton splash. Owens with kicks to the lower back of Reigns, throws knees and stomps. Reigns catches Owens with a series of clotheslines. Owens avoids a jumping clothesline attempt by Reigns and bails to the outside. Reigns follows him out, grabs Owens and Owens drops Reigns throat first over the timekeepers barricade area. Owens then tosses Reigns shoulder first into the steel steps. Owens with a Senton Splash on Reigns over the floor off the steel steps. Back inside, Owens keeps Reigns grounded in a chin lock. Owens yells, “If you’re so tough why didn’t you put your title on the line! ?” Owens with a neckbreaker and somersault over Reigns coming down with a leg drop. Owens goes back to a headlock to keep Reigns grounded. Owens misses another senton splash attempt when Reigns moves. Owens and Reigns exchange rights. Reigns connects with his jumping clothesline. Owens with a forearm. Reigns with a right. Reigns with a boot and samoan drop combo on Owens. Owens with a DDT on Reigns countering a Superman attempt for a two count. Owens mocks Reigns and connects with his cannonball in the corner. Reigns is right back up and connects with a Superman. Owens kicks out after two. Reigns with shots to Owens in the corner. Reigns has Owens up top. Owens with shots to the ribs of Reigns and elbows to the face. Reigns falls back. Reigns with a Superman to Owens who was sitting on the top turnbuckle. Reigns is climbing up top. Owens counters and drops Reigns down in a suplex off the top rope! Owens hooks the leg and Reigns kicks out after two. Owens attempts a swanton from the top, but Reigns gets his knees up. Reigns calls for the end in the corner and Owens rolls out. Reigns catches Owens with his drive by dropkick on the outside. Reigns tosses Owens back in and Owens rolls out again. Owens with two superkicks catching Reigns on the outside. Owens tosses Reigns over one of the announce tables and connects with a frog splash! The table stays up. Owens goes for a second frog splash and this time the table crashes as he connects over Reigns. The referee begins the count as Owens is back in. Reigns is back in at 9. Owens catches Reigns with another frog splash off the top turnbuckle immediately for a two count. Reigns with a sitdown powerbomb for a two count on Owens. Owens catches Reigns with a Pop Up Powerbomb lifting Reigns up and Reigns gets his foot on the bottom rope during the pinfall. Owens bails and grabs the Universal Championship. When he gets back in, he goes to hit Reigns and Reigns connects with a spear. Both men are down. Chris Jericho is inside the ring. Jericho with a Codebreaker on Owens. The referee calls for the bell. After the match, Chris Jericho grabs the WWE Universal Championship and smiles at Kevin Owens. He hands the title back to Owens and raises his arm in the air. Jericho and Owens start heading up the ramp celebrating when Seth Rollins walks out. Reigns with a spear to Owens on the outside. Rollins with a Pedigree to Jericho inside the ring. Rollins and Reigns clear off another announce table at ringside. Rollins lifts Jericho onto the shoulders of Reigns and Reigns powerbombs Jericho through the announce table. We see a shot of Owens starting to walk to the back when Rollins catches up with him. Reigns runs up to the ramp and they both attack Owens. They clear the main announce table off. Rollins puts Owens on the shoulders of Reigns and Reigns powerbombs Owens through the announce table. Both Rollins and Reigns stand tall getting a mixed reaction in Pittsburgh.